The Sutong Bridge lies between Nantong City and Changshu in the east of Jiangsu province and will become part of the national key trunk route. 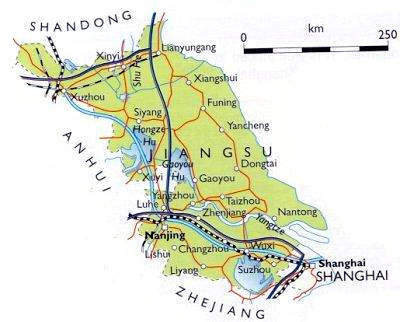 Map of Jiangsu province - the Sutong Bridge will be located near Nantong, to the east of the existing bridge. 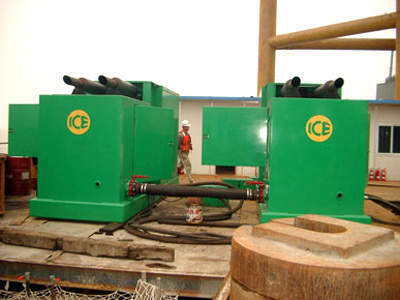 ICE power units used to power the V360 hydraulic vibratory driver / extractor hammers. ICE V360 hydraulic vibratory driver / extractor hammers. Typical screen of the Primavera P3e/c software program for construction and engineering. The Sutong Bridge involves only Chinese construction contractors, although some international companies have been involved in planning and consultancy. Segments of the orthotropic deck were created offsite and hauled into position by barges. The 1,088m span of the bridge requires 32.2km of cable. The Sutong bridge is claimed to be the world's longest cable-stayed bridge to date. In June 2003 construction began on what is claimed to be the world’s longest span cable-stayed bridge to date. The Sutong Bridge lies between Nantong City and Suzhou of Jiangsu province, and became a part of the national key trunk route planned by the Ministry of Communications from Jiayin in Helongjiang province to Nanping in Fuijang province. Sutong Bridge, which crosses the 6km Changjiang River, has several roles: it has aided the trunk road net in both the province and throughout the country; it has improved safety for vehicles crossing the river; and has reduced the pressure of increasing traffic. The bridge was completed in January 2008 and was officially opened for traffic in June 2008. Sutong Bridge is the winner of 2010 Outstanding Civil Engineering Achievement award (OCEA). The Sutong Bridge was an all-China project. 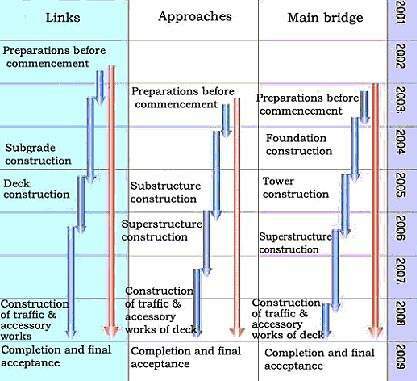 No international participations were invited for the bridge construction. The construction contractor selected was China Harbour Engineering Group (CHEC). 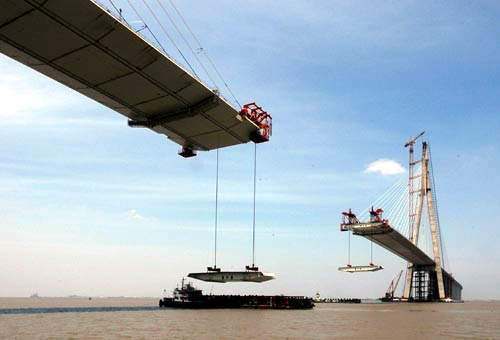 The project managers were the Jiangsu Sutong Bridge Construction Commanding Department, a team compiled from the National Communications Ministry, Jiangsu province and Suzhou and Nantong cities. Doka (Deutsche Doka Schalungstechnik GmbH), the formwork manufacturer, is supplying climbing technology for use in the construction. There are 36 Doka SKE 100 climbers at either end of the bridge and these have the job of placing over 68 casting sections on each pylon. The use of the powerful hydraulic climbing units meant that a large part of the construction was crane independent and as such was unaffected by poor weather – it can still operate in wind speeds as high as 70km/h. Although no international assistance is required for the actual construction, some non-Chinese companies have been involved in both planning and advising the project team. COWI A/S (Denmark) was awarded a DKK65 million contract to provide consultancy services on concept and design, to support the Chinese in managing and undertaking the project, to provide technical assistance, make wind tunnel experiments and train young Chinese engineers to manage the project, to ensure quality and manage operations and maintenance. Force Technology was also involved in conducting the wind tunnel experiments. 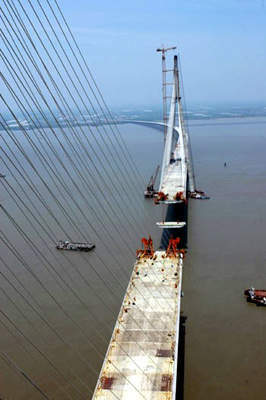 Jiangsu Province Communications Planning and Design Institute were involved in the design of the bridge. 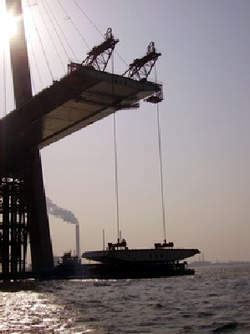 Maunsell AECOM was the Engineering Consultant to the Second Navigation Engineering Bureau (SNEB) of China Harbour Engineering Group, who was awarded the prestigious Contract C3 for the superstructure construction of the Sutong Bridge. Ove Arup (UK) was contracted to provide construction management services, and Lord Corporation (North Carolina, USA) was selected to help develop a structural monitoring system using the company’s magnetorheological (MR) fluid formations and damper designs. Technical advisers for the project included individuals from Tongji University, Bridge Survey and Design Institute of China Railway Construction Company, Ministry of Communications, Hong Kong Civil Engineering Association, Tokyo University, COWI A/S (Denmark), TY LIN Company (USA). To assist in managing the project, the Jiangsu Sutong Bridge Construction Commanding Department purchased the Primavera P3e/c software program for construction and engineering. P3e/c helps manage construction projects, large contractors, engineering firms, design-build firms, engineers, procure and construct firms and owners. It aids planning and scheduling, project control, cost management, resource / materials management, project management and analysis / reporting. The Sutong Bridge is located at the Chengong watercourse of Changjiang River, an S-shaped river with a varying width between 6km and 14km wide, and a maximum depth of approximately 50m. The bridge will span the 6km-wide river near Xuliujing. The Changjiang River is a tributary of the Yangtze River, situated close to the river mouth by the Yellow Sea. The bridge will be 280km west of Nanjing, 90km from the Yangtze River Bridge in Jiangyin and 100km east of the Yangtze River estuary. Jiangsu province is an important, growing, industrial region in China. It has a population of 74 million people. 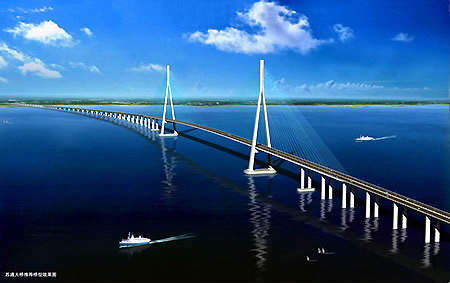 When completed, the bridge will join the Nantong-Qidong section (under construction) of the Ningbo-Qidong Expressway, as well as other coastal expressways in the north. In the south, the bridge will link up with the Shanghai-Ningbo Expressway, the Suzhou-Jiaxing-Hangzhou Expressway (under construction), and other highways that follow the Yangtze River. There is currently an annual increase of 15% of traffic users crossing the Yangtze River in the Jiangsu region. In Nantong, this increase is as much as 20% annually. Forward predictions of traffic numbers crossing the river in the Nantong area (per day) were 41,432 in 2005, increasing to 70,624 by 2014, and 89,556 in 2025. There were four car ferries crossing the river in this region – these traffic increases were clearly too much for these ferries to manage. The ferry journey takes 1hr – with the bridge being completed this journey time has reduced to five minutes. The total length of the crossing is 8,206m. The main bridge is a double-cable-plane, double-pylon steel box girder cable-stayed bridge. The central span of 1,088m has a height of 62m, which will allow fourth and fifth generation container ships to pass through in all weather. The bridge and its approaches are of six-lane expressway design, with a maximum speed of 100km/h. Over 32.2km of cable was used in the bridge. The project will require 200,000t of steel, 1 million m³ of concrete and 3 million m³ of earth for filling. After completion, the bridge created four new world records for cable-stayed bridges: its 1,088m span is the longest; the 306m-high main bridge tower is the highest; the two foundation piers of the main bridge are the deepest; and the longest stay of the main bridge is the longest in the world, so far, at 580m. China Harbour Engineering Company, the main contractor for the bridge construction, purchased two V360 hydraulic vibratory driver / extractor hammers from International Construction Equipment Inc (ICE) of North Carolina, US. 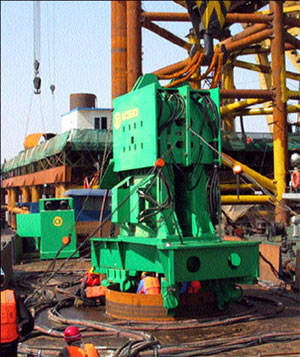 These machines were used to drill the foundation piles 395ft into the ground, through seven different layers of ground consisting of mainly medium-dense to very-dense fine sand. The casings for each pile weighed 135t, with dimensions of 9.25ft in diameter, 230ft in length, with a wall thickness of 1in. The hammers were set up in tandem so that they worked together. These machines completed the driving of more than 200 casings within six months. Dorman Long Technology was the sub-contractor for the design, supply and site supervision of the deck erection gantries, to the 2nd Navigation Engineering Bureau. 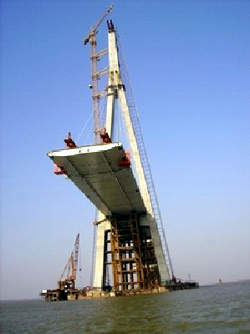 The first 16m 450t deck segment was erected on 9 November 2006, an operation which included a 125% overload test and a 110% dynamic test. The last segment was erected on 9 June 2007. The steel orthotropic deck for the bridge was fabricated offsite and was delivered by barge for erection. The gantries worked in pairs to lift and align the deck units. Each gantry has one 290t capacity DL-S290 strand jack to lift the deck unit and a system of secondary hydraulic rams to carefully adjust its position. The total cost for construction of the Sutong Bridge is estimated to be $6.45bn ($750m). $2.2bn ($266.12m), amounting to 35% of the total, was collected by the local governments of Jiangsu province (60%), Suzhou City and Nantong City (20% each). The remaining funds were sourced via loans from domestic banks. The bridge is being tolled and the fares received are being used to pay back the loans.